John Calvin contemplating predestination, the absolute authority of God and the merits of beheading vs. burning his enemies alive. Calvin Wiggs contemplating a mountain of clues that add up to, for him, nothing. The Trouble with Harry is a suspense film without a villain. Hard trick to pull off! The closest the film comes to having an antagonist is with the defanged Deputy Sheriff Calvin Wiggs (Royal Dano). Hitchcock author Ken Mogg recently noted on his blog (May 16) that there was no character like him in the original Jack Trevor Story novel. Evidently, Wiggs was either a creation of Hitchcock or of screenwriter John Michael Hayes. Ken speculates that since "Vermont's most famous son was the drawling Calvin Coolidge [1872-1933], [that U.S. president was] no doubt an inspiration for the name of Calvin Wiggs." The town church in a film laced with religious imagery. Royal Dano may have been inspired by Coolidge in delivering his performance, but I'd say the name -- and the character behind it -- more rightly refers to Protestant reformer John Calvin (1509 - 1564). 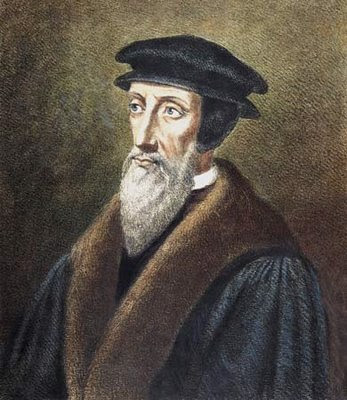 After all, Wiggs stands for the rule of law in the town, even as John Calvin promoted a theology that is distinctly authoritarian (starting with his own: he had a practice of burning his detractors at the stake). A sharply Calvinistic take on this random-seeming occurrence! Marlowe’s detached, tongue-in-cheek defense of Wiles’ decision to hide the body reminds me of Rope and Rupert Cadell's cool argument (performed by James Stewart) on behalf of the Nietzschean few who, by virtue of their intellectual superiority, have the right to commit murder. With both Cadell and Marlowe, we don't know if they're joking or not. Which was Hitch's way of playing both sides of the fence. Recall that the Catholic Hitchcock once turned down an opportunity for a private audience with the Pope, fearing that the pontiff would order him to stop making his brand of films. In that story, you can sense the particular blend of skepticism and wary devotion that informs so many of Hitchcock's films, including The Trouble with Harry. Have I told you lately that I love you, Alfred Htichcock Geek? Seriously this post is all kinds of awesome. I think this this post is predetermined to go to all kinds of paradise, dude. I never noticed the Calvinist connection, but yeah you are totally right, that is a classic New England/Calvinist reaction. I can't imagine that Hitchcock had much familiarity with this part of the American psyche. I mean Sarah Vowell wasn't even born yet. Did Hitchcock ever spend any supstantial amount of time in New England? Aw, I love you too, Jenny! I'm gonna guess that Hitch had a pretty good feel for American culture and its idiosyncracies. In fact, you've inspired me. watch this space for a new blog post. I had a feeling the dialogue you quote came pretty much from Jack Trevor Story's original novel, so I checked, and it does. Pretty much verbatim. So the naming of a character as Calvin may well have occurred for the reason you suggest, but we must conclude that Hitchcock or Hayes found the idea lurking in the original novel. Which was of course set in Old England, in the United Kingdom, not New England, USA! Thanks for that research, and the correction, Guy! (I'm embarrassed to admit I haven't read the novel.) It was Ken Mogg's suggestion -- not mine-- that Calvin Wiggs was named *in part* after Calvin Coolidge, as well as John Calvin. Ken insists that Coolidge had to have been on screenwriter John Michael Hayes' and Hitch's mind, but his evidence is circumstantial, and I just don't buy it. Additionally, I think it's also plausible that Hitch and Hayes took advantage of the coincidence to play up the Calvinistic aspects of Calvin Wiggs as they developed the character.